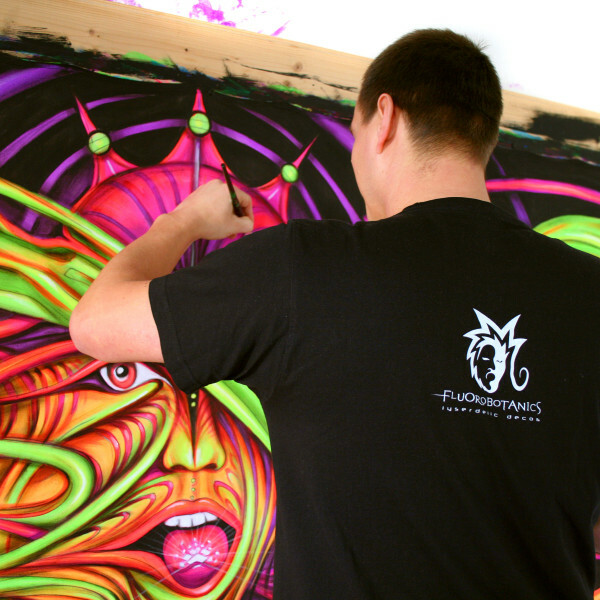 The Fluorobotanics is artist Lukas Kavik who specialize in fluorescent paintings, mindblowing psychedelic backdrops and installations for parties. The style of the painting has gone through several changes, and has reached the level to match the artists’ visual concept. The history of the Fluorobotanics painting concept includes many past experiments with techniques and various media, with the subject matter always pertaining to nature – from the abstraction of natural forms, to fully interconnected organic forms. Through art, a means of visual communication is established. The backdrops create a surreal pseudo-3D space where people can move and let their minds and feelings wander. The work of art expresses feelings, visions and energy which can incite your imagination. These paintings help to bring a good atmosphere to a gathering – which is important when planning a successful party. They are an integral part of it. Well-known spaces are magically transformed into something from another dimension with the help of these beautiful works of art. To emit the awe-inspiring fluorescent effect these paintings carry, it is necessary to illuminate them by use of ultraviolet [black] light. Lukas studied Industrial Design and has succesfully graduated from the University of Ostrava – Faculty of Fine Arts. Nowadays he works in commercial visual communications and as interior designer, with the Fluorobotanics project being a favourite hobby.